Virginia Counselors Association 2018 Annual Convention! Norfolk, VA.
Hello! My name is Jessica Bardenheier and I am a second year graduate student at Longwood University in the Counselor Education program, Mental Health Counseling Track. I recently attended the VCA Annual Convention in Norfolk, Virginia. It was an incredible experience! Many current students from the cohort attended as well as professors and alumni. I felt right at home with all the friendly faces! The convention offered a wide variety of sessions, covering diverse topics in the field of counseling. As well, I attended an awards ceremony to be recognized by the Virginia Counselors Association Foundation as a 2018 Pete Warren Fellows. I got to receive the award from my current professor and Department Chair, Dr. Kevin Doyle. This made the whole experience feel like it came full-circle because of all the Lancer representation at the convention and awards ceremony! We filled two big tables! My favorite sessions at the convention focused on trauma-informed care, self-care for clinicians, and utilizing the concept of “positive triggers” and compassion in crisis situations, in order to re-frame cognitions, and minimize traumatization on clients. I felt that everyone at the conference was like-minded in that there was a palpable passion for this helping profession being expressed and felt throughout. It was energizing to be around so many well-versed counselors from all over the Commonwealth of Virginia and to be able to learn and grow with them. Specifically, it was especially refreshing to see so many sessions being presented by other graduate students, not just professors. This allowed me to see the depth of work that is being done at all levels of this profession and how many amazing, well-rounded Counselor Education programs there are in the state. I saw sessions from students at JMU, Virginia Tech, and others. 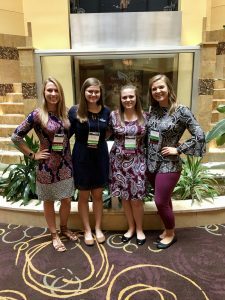 Longwood was in good company at this convention! This also made me start thinking about doctoral programs once I graduate because of all the growth opportunities in this field. I am very grateful for the opportunity to have received a travel grant from Longwood for this event. Without it, I would not have been able to engage in this caliber of professional development in such an intentional and meaningful way. 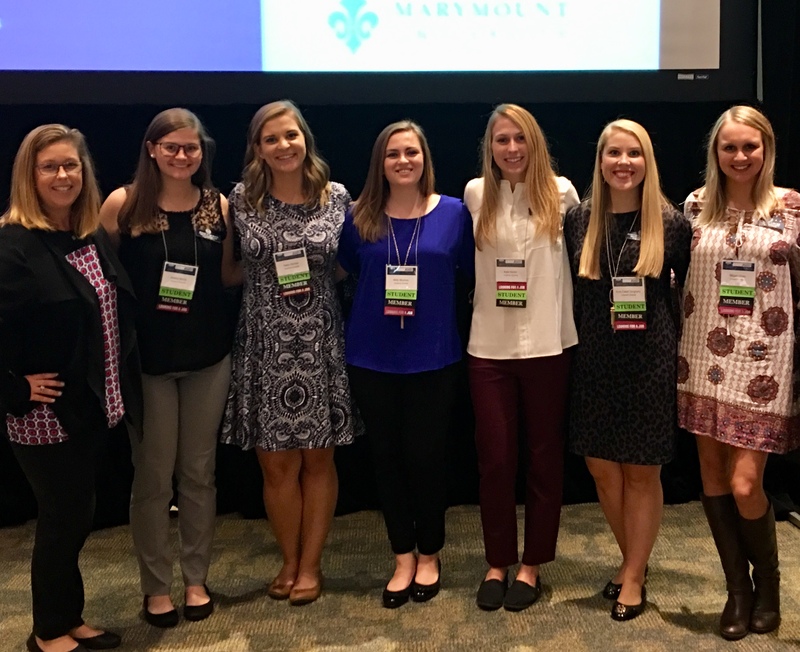 I highly recommend seeking out professional development opportunities and avenues to represent the graduate cohorts within Longwood Graduate Studies! This opportunity allowed me to grown in my professional and therapeutic identity as a counselor and graduate student. I am looking forward to VCA’s 2019 convention and to have an even great Longwood turnout! 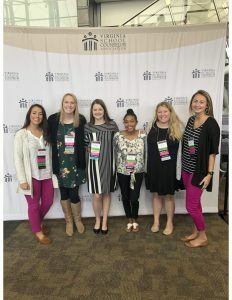 I had the opportunity to attend the Virginia School Counselor Association (VSCA) Conference on October 17th-October 19th in Hampton, Virginia. As a school counselor, it was awesome to learn new ways to support students in achieving their social/emotional, academic, and career goals. I also had the opportunity to learn new activities and techniques to utilize when working with students. One of my favorite sessions was “Calm Down Smack Down” during this session the participants learned how to create calm down stations for students to utilize during the school day. I had the opportunity to create mindfulness bottles and stress balls as part of the “Calm Down Smack Down” session. Lastly, it was nice to network with counselors from the elementary, middle, and high school level. I am looking forward to attending the VSCA conference next year!!! Hello! My name is Emory Read and I am a graduate student in the Counselor Education program and I am in the School Counseling Track. This past October, I had the opportunity to attend the 2018 Virginia School Counselor Association Conference. I was able to network with other school counselors and learn valuable information that will help me as a future school counselor. They had wonderful keynote speakers who spoke about how school counselors can make an impact. There were also representatives from various colleges/universities, companies, and programs who had information to give that would be helpful to us in the school counseling profession. 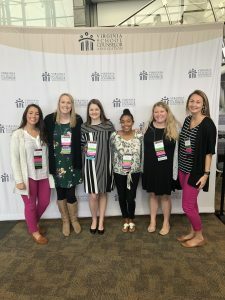 It was amazing to experience this conference with my classmates and be around so many people who are passionate about making a difference in the lives of students. There were various breakout sessions that we could attend that ranged from learning about classroom management to learning how to use mindfulness/yoga in the classroom. I went to a session called “How do you want to change the world”, which stood out to me because the purpose of this session was to change the way that we talk to students about what they want to do in the future. I would recommend going to a professional conference if you get the opportunity because not only are they a great experience, but it really makes you appreciate the profession that you are going into. I am already looking forward to the VSCA conference for next year! 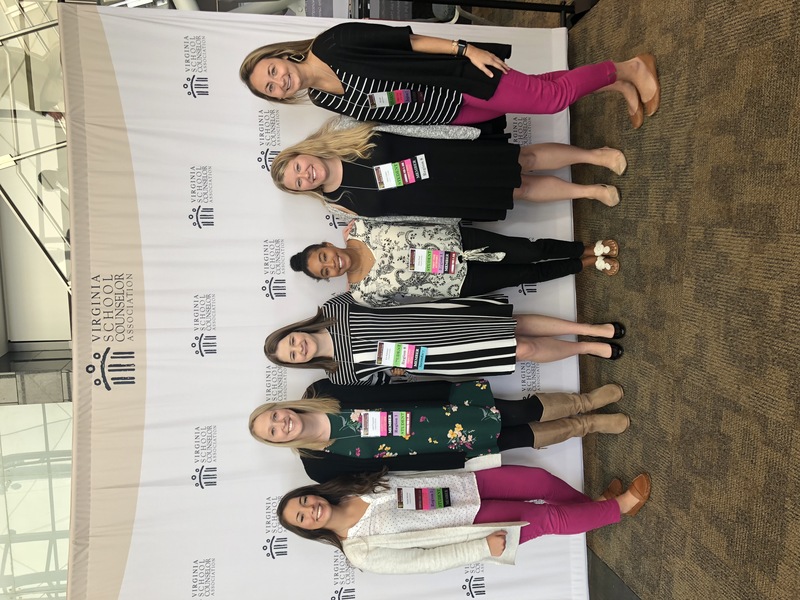 Experiencing my first Virginia School Counseling Association Conference was an amazing opportunity to network, gain knowledge on different topics, and receive practical resources to use at my internship. My entire cohort attended the conference, where we had the chance to go to different sessions and share the information we learned to one another. The session that stuck out to me the most was called: “Suicide and Non-Suicidal Self-Injury: Prevention, Intervention, and Postvention” presented by Melissa Reeves. One of the greatest takeaways was learning the differences between non-suicidal self injury and suicide and ways in which school counselors can promote suicide prevention. One example could be complete training with administrators and staff on Applied Suicide Intervention Skills Training (ASIST). One of my favorite parts of the conference was being able to volunteer with my classmate. We were given the role of check-in on the first day of the conference. It was a perfect opportunity to welcome each member to the conference. I also enjoyed introducing myself and hearing stories as a school counselor. I gained a lot of insight on the role of a school counselor, as well as, made connections with counselors in the field. Overall, I had an amazing time at the conference and I look forward to returning next year! Going to the Virginia counseling associations annual convention at the Homestead resort was educational and quite a treat. I was able to attend a session on Friday, November 10 entitled “please don’t forget the T (in LGBTQ, that is!) : Understanding and collaboratively advocating for trans individuals.” The session on Friday evening was presented by Longwood’s own Kathleen McCluskey and Valerie Stolicker entitled “Empowering clients in the face of an uncertain political climate”. I was particularly interested in the discussion surrounding the town in which I call home, Charlottesville, Virginia, and the various perspectives represented. On Saturday morning I went to a session “Trans-affirmative counselor self-efficacy”. The presenter, Cory Gerwe, was extremely knowledgeable about the topic. I really appreciated the audience participation in each of the sessions and building greater knowledge and understanding of important aspects of the career. I look forward to future conventions, with the chance that one day I may present a topic myself. 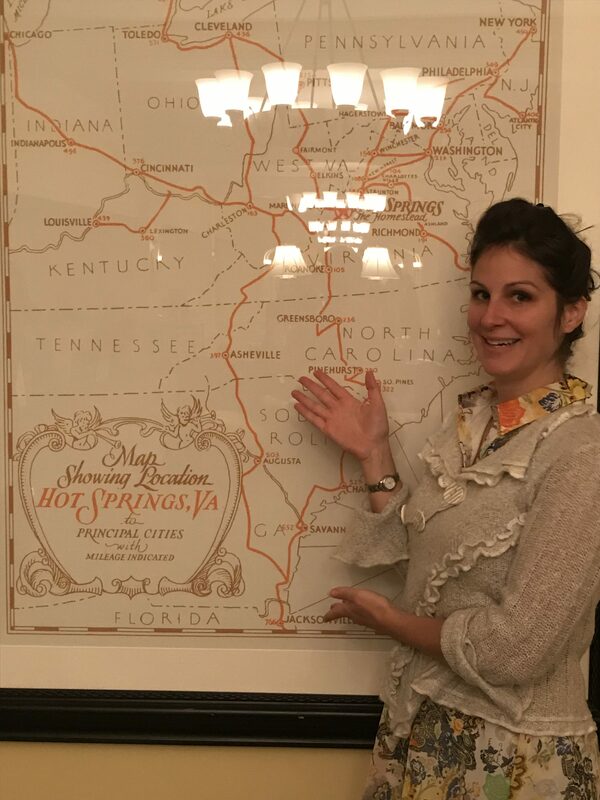 I attended the Virginia Counselors Association conference in Hot Springs, VA at the Homestead. The conference had many exciting sessions and some so close together that it was difficult to choose which to attend. I attempted to attend in my classmate’s presentations as well as presentations I believed would help me professionally. One of the most interesting presentations that I attended was focused on the riot in Charlottesville, VA. The presentation was given masterfully by Longwood’s own Dr. Kat McCleskey and Valerie Stolicker the audience was so engaged that the presenters went over their time. Another presentation that I believe will help me professionally was a seminar on dialectical behavior therapy, which is primarily used to treat personality disorders as well as mood disorders. Though the technology failed during the presentation, there were a few experts in the audience that gave valuable information to counselors new to the therapy. Over the course of the conference, I learned so many new things about counseling and the clients that receive therapy. The networking opportunities were amazing, and I met counselors and counselor educators from all over Virginia. The conference was also fun; I got to enjoy the conference with classmates and other counselors that I met along the way. 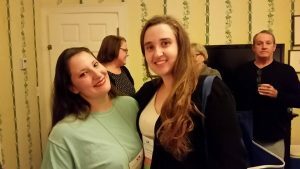 This November, I attended the 2017 Virginia Counselors Association (VCA) conference at the Omni Homestead in Hot Springs, VA. This was my second year attending this annual conference, however, it was my first year as a presenter. I presented with Dr. Lauren Wynne on counseling adolescents about sexuality and with Dr. Kat McCleskey on the integration of ASERVIC competencies into counseling practice. Working with both professors was a great experience and it was a very rewarding experience to share my knowledge with other professionals in the field. In addition to my own presentations, I was able to attend presentations on a variety of meaningful and important topics. Overall, the knowledge I gained was very valuable. 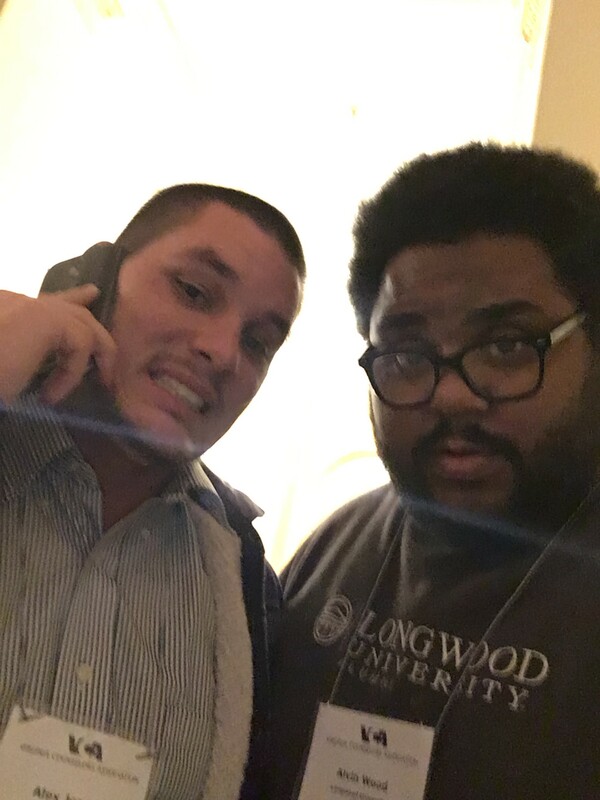 Even better than all of the professional learning I was able to engage in, I was able to meet and socialize with a multitude of other Longwood students, professors, and alumni. I enjoyed meeting other Lancers and learning more about what others have done in the field with their Longwood training. I look forward to the possibility of attending VCA again next year, but this time hopefully I will be one of the alumni to meet! Hi all! My name is Jessica Morris (in the navy dress!) 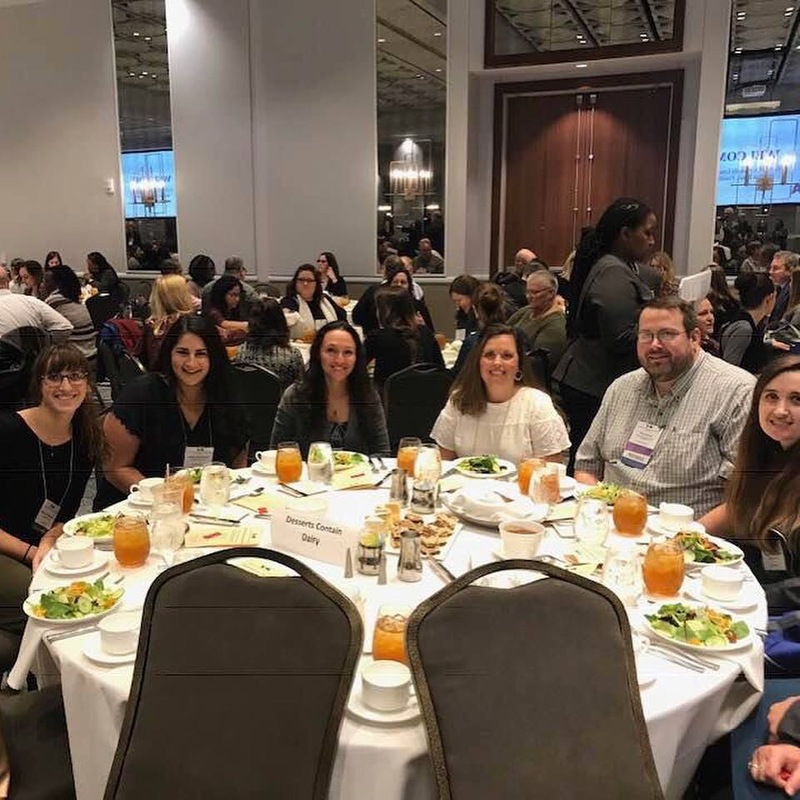 and last week, I attended the Virginia School Counselor Association conference in Hampton, VA. My school counseling cohort arrived to the Embassy Suites in Hampton on Wednesday night. After we checked in to our hotel rooms, we went downstairs to a meet and greet where we could mingle with other school counseling professionals. We were up bright and early on Thursday morning for continental breakfast and we then headed next door to the conference center. After an exciting keynote speech, we split up and attended breakout sessions about various school counseling topics. That night, there was another meet and greet at our hotel and we were able to connect and talk with some of the people we had met earlier in the day. Friday was our last day. We again attended breakout sessions and a closing keynote speech and luncheon. For my first conference experience, I really enjoyed it! I think my peers and I learned a lot and I look forward to going again in the future! I enjoyed my experience at the 2017 Virginia School Counseling Association (VSCA) Conference in Hampton Roads. Lead Well was the theme for the 2017 conference. My favorite part of the 2017 conference was the opening session keynote speaker Dan St. Romain, M.Ed. Mixed Messages: The Changing Face of Discipline. The home, school and society has drastically changed within the past few decades resulting in a striking effect on student behaviors. During Dan St. Romain’s collaborative session, participants assessed the dynamics and examined implications for school counselors as a result. The remainder of my day consisted of attending specific breakout sessions focusing on Well-Being Therapy, Supporting Transgender and Gender Non-Conforming Students, Graduate Student- Roundtable, Filling the Gap: Identifying and Developing School Counselor Leaders and The Power of Passion in Career Development. I appreciated the Graduate Student Round Table the most since it focused on the issues and topics related to starting careers in school counseling. That night I attended a Networking Social for School Counselors. 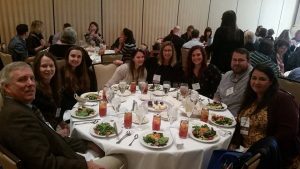 Friday involved attending three other breakout sessions and closing out the conference with an awards luncheon and keynote speaker. I am glad that I attended the 2017 VSCA Conference and appreciative of the experiences I took with me.